5000/360 High speed strip packaging vertical machine Vertical high-speed, four-side sealing/pouching machine Mod. 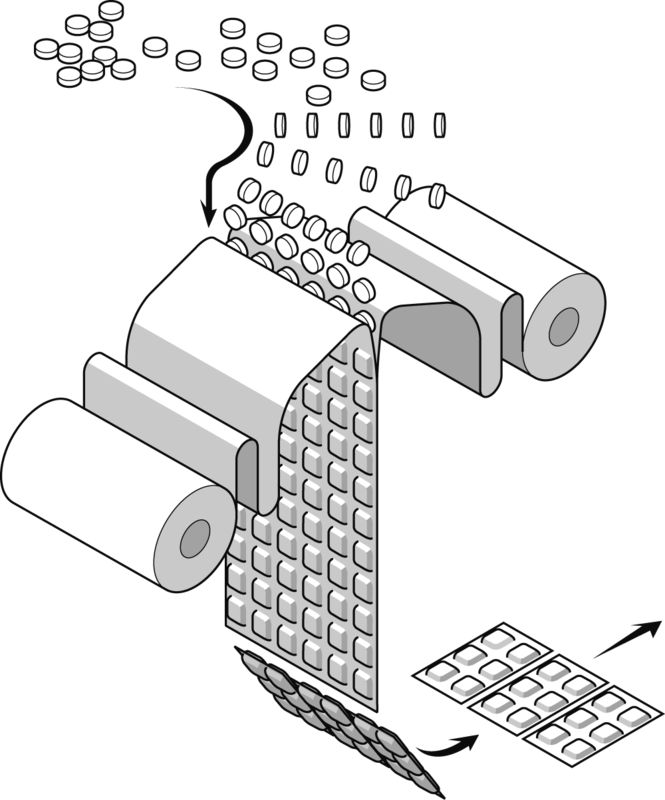 5000/360, designed for packing tablets, capsules and effervescent tablets. The number of rows depends on the product and effective production speed required that influence machine foil width range. The machine speed is up to 300 cycles/min – depending on product size – for up to 12 product rows. Suitable for all heat-sealable films (excluding pure polyethylene) such as cellophane, aluminum, coated paper and laminates, plus all combinations of these materials. The basic machine consists of mechanical parts, format-based parts excluded, basic electrical components (separate temperature controls for the sealing rollers etc. ), and complete guarding. 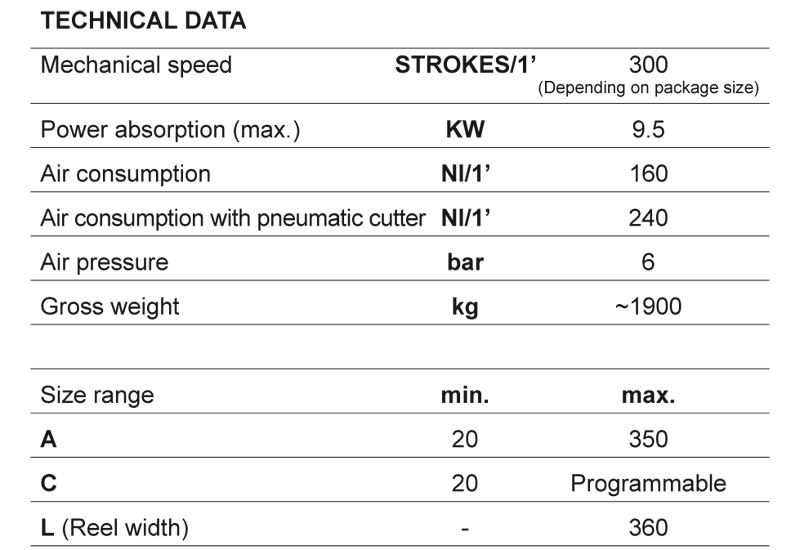 The machine is designed and built in compliance with GMP regulations. 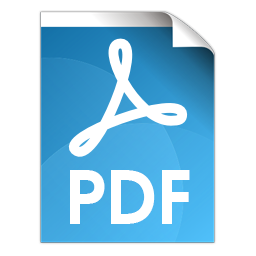 The machine has a cantilever structure for complete, easy accessibility to all machine parts. All format parts are realized for an easy and quick change over. 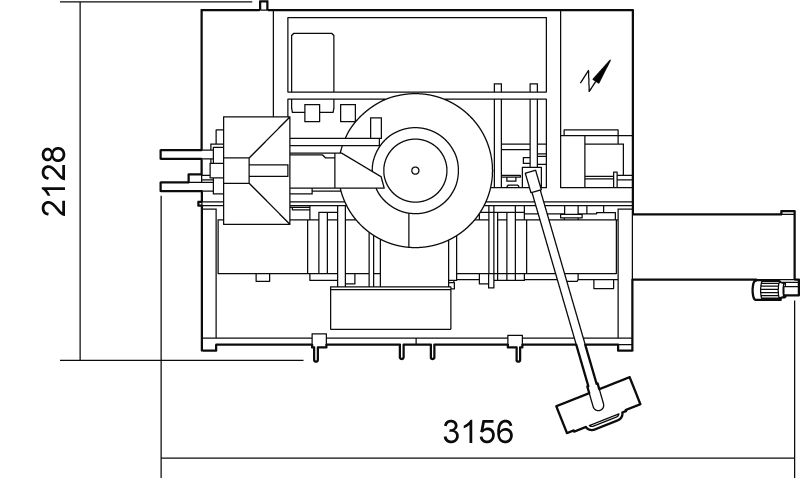 Its compact design and complete machine accessibility allow easy maintenance and cleaning operations. 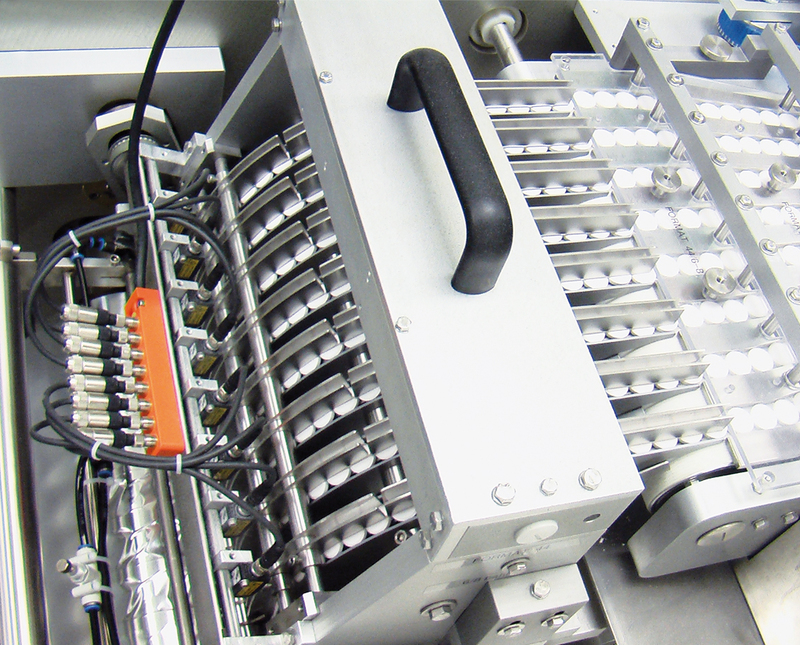 The complete machine is realized with a surface finish in accordance with pharmaceutical requirements. 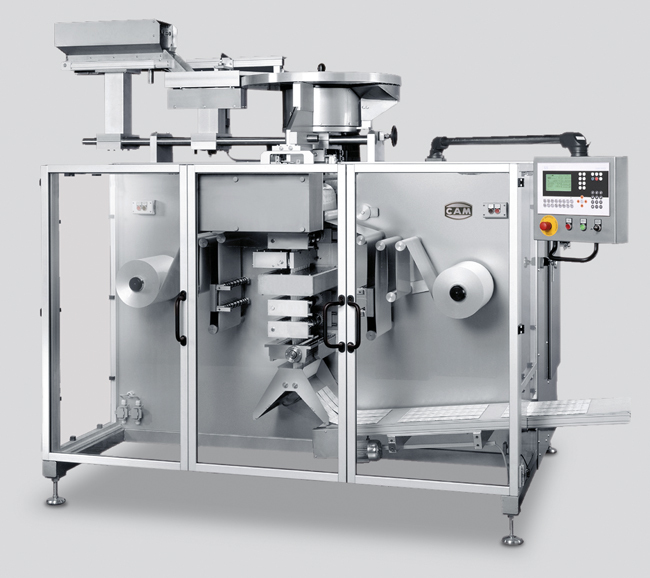 Packaging material is fed from two reels by a film unwinding unit, equipped with a foil tension control system, directly into the sealing station. The machine is equipped with an easy temperature and pressure setting unit. 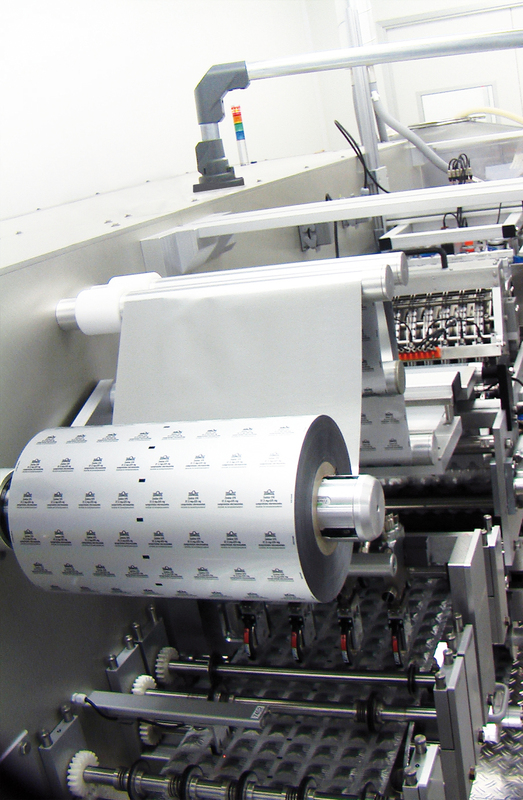 The product infeed unit transfers the products correctly oriented and synchronized with the sealing rollers. The products thus pass directly between the cavities of the sealing rollers where they are packed between the two webs airtight. 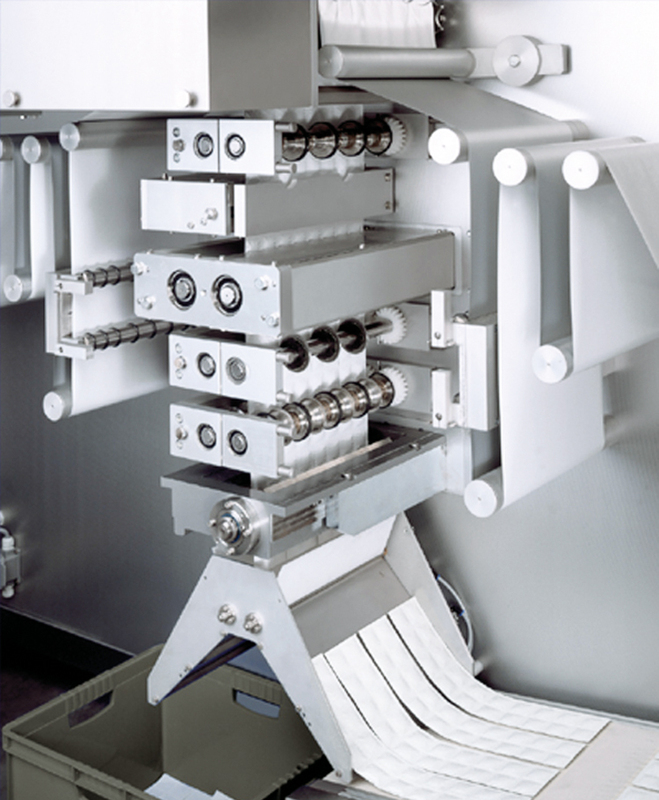 Additional standard components and optional devices are available: longitudinal and cross perforation, easy opening slot, hole punching station, coding (embossing ink-jet or flexo printer), print mark centering control, product-in-pouch control, 3 way chute, outfeed conveyor, grouping outfeed belt, line integration and interfacing with up or downstream machines, customized requirements upon request.